I cannot start this post without commenting on Paul’s amazing lion bread sculpture. How impressive was that? I did briefly entertain the idea of making a bread sculpture of my own (obviously in the shape of a cat), but sometimes life is too short eh? Baguettes are something I would like to make one day, but not this weekend. Then I thought I might make two types of soda bread: one plain one to have for breakfast this morning with cream cheese, smoked salmon and capers; and one tartiflette-inspired one to have for breakfast tomorrow morning with reblochon cheese, lardon, onion and potato. 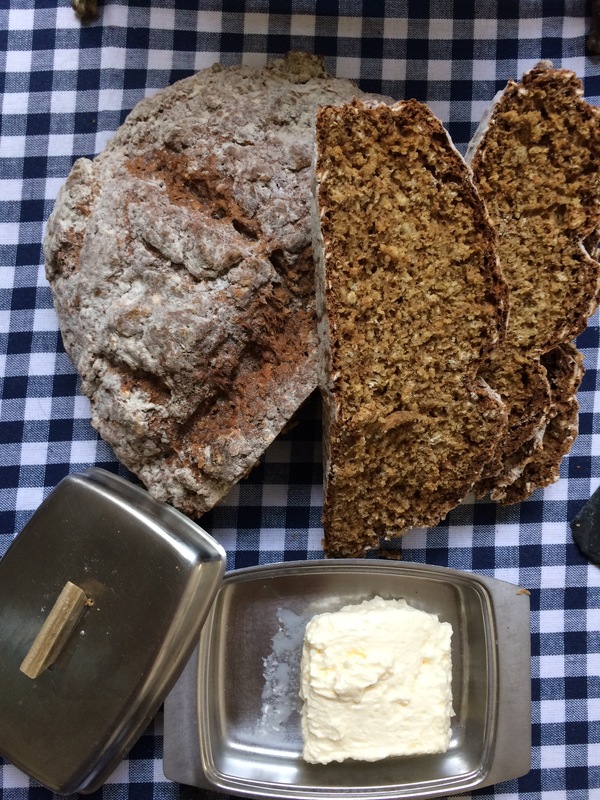 However, our breakfast plans for tomorrow have now changed as we’re going to be out and about, so to jazz up the plain soda bread I decided to make some home-churned butter. I have wanted to churn my own butter since my birthday. You may remember my post about the wonderful Morston Hall in Norfolk? Well, on the way home we went on a jaunt to Cromer and the North Norfolk coast, and Andrew bought me a Kilner butter churner as an extra birthday present. 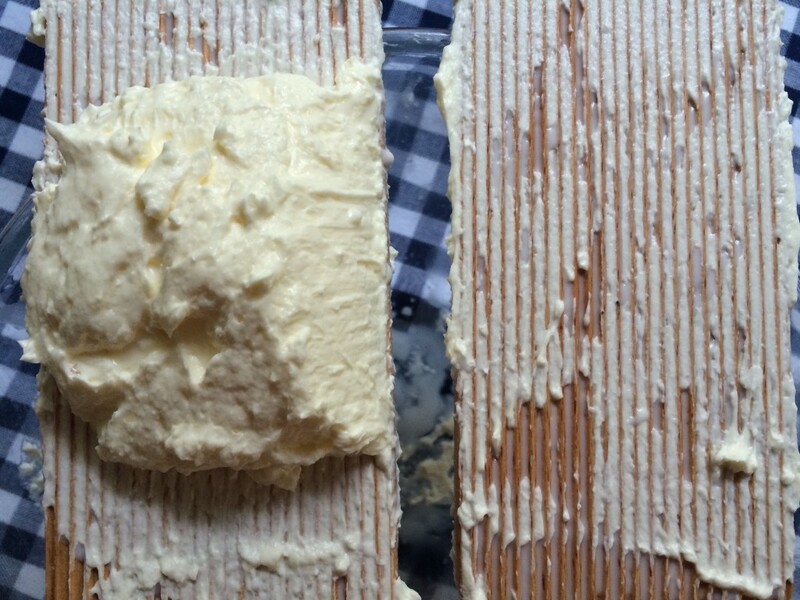 This, and a pot of whipping cream is all you actually need to make butter, although it helps if you can have someone to help you churn it – in this case I gave the job to Andrew. He can’t cook, but he can provide hard labour (not really hard, more dull). In a nutshell you take a 300ml pot of room temperature whipping cream and whip it (get your kitchen boy to whip it) until the butter separates from the buttermilk. Drain away the buttermilk (I want to use mine to make scones), and you have basic butter. 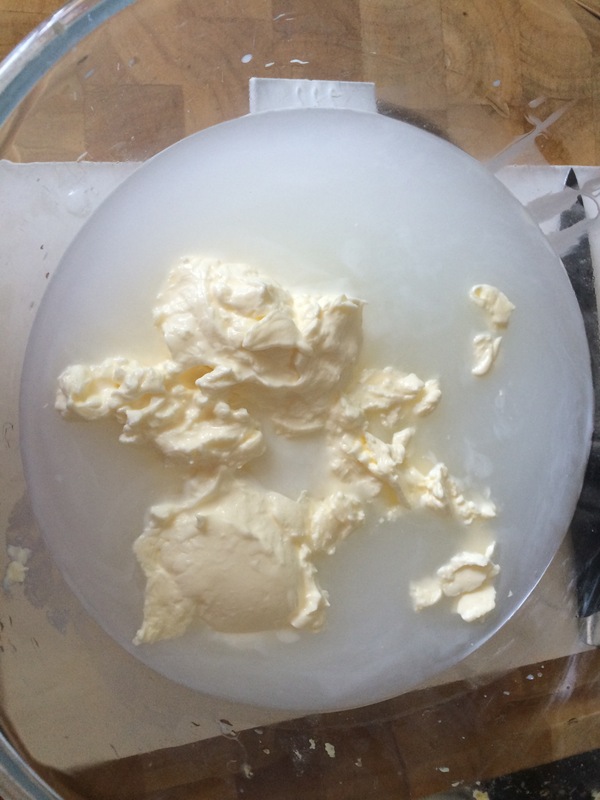 To get rid of the whey, you need to wash the butter in cold water (a friend suggested freezing cold water would be easier, and I agree as the butter did stick to my hands a bit). You kind of massage the butter in the water (changing the water a few times) until the buttermilk is all washed off. A strange experience. 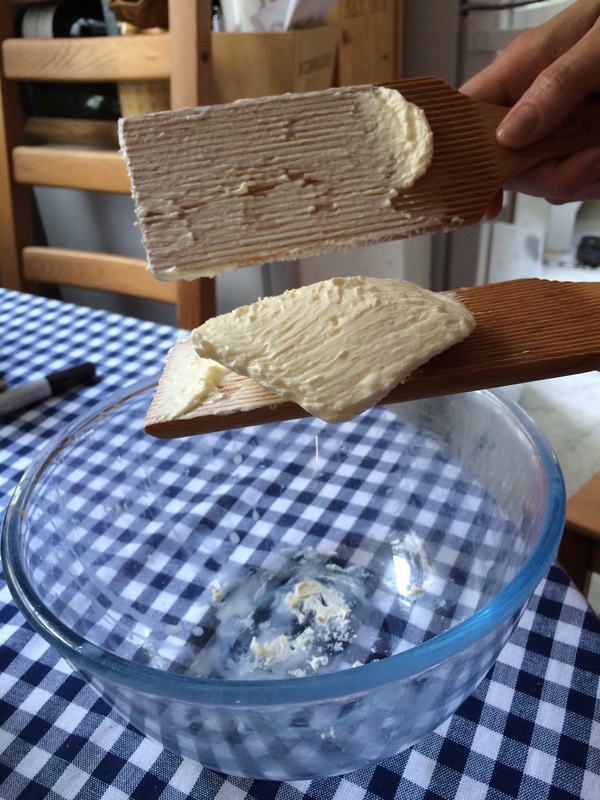 Then use some butter paddles (another birthday pressie from Andrew – also Kilner ones) to pat and shape the butter. This allows some of the excess water to drip off too. I didn’t know what I was doing but it seemed to work if I transferred the butter from one paddle to another. And then I shaped the butter into a little slab. Here it is in my Nan’s butter dish, which I inherited when my Grandad died. Hardly a family heirloom, but it reminds me of them both and seemed kind of appropriate for this homemade butter. 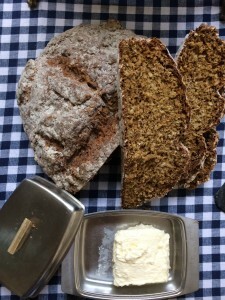 Then for the soda bread: I used a Richard Corrigan recipe which includes treacle, giving it a deliciously dark colour. 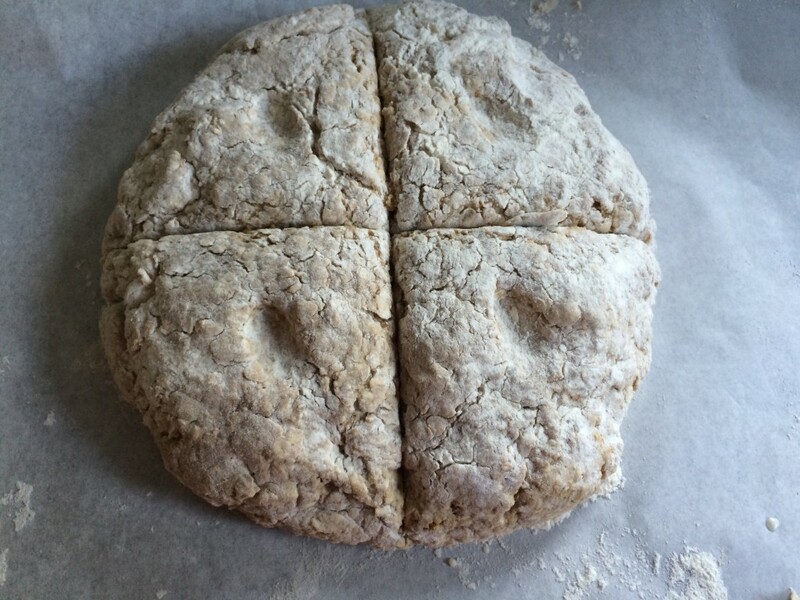 I weighed out all of the dry ingredients the night before (including plain flour, wholemeal flour and oats, salt plus the rising agent of soda bread, bicarbonate of soda). When I woke up this morning I added the wet ingredients: honey, treacle and the bit that reacts with the bicarb: buttermilk. 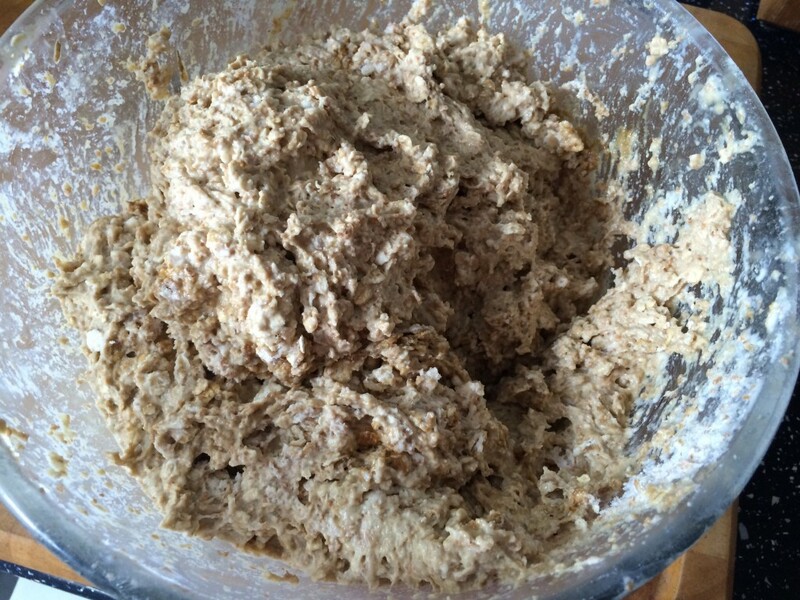 You simply need to mix together the wet and dry ingredients, just until they come together, as the more you work the dough the tougher the bread becomes. The dough mixture stays surprisingly wet, so with floured hands you shape the dough into a round loaf and cross it deeply with a knife. Apparently that lets the devil out or the fairies in or helps the bread cook more evenly – I can’t remember exactly. 40 minutes in the oven, and less than an hour after stirring everything together, you have your loaf of bread. In that time you (or Andrew) can make your butter to spread on top of the warm bread (seriously, is there anything better?). And you can top that with smoked salmon and capers, alongside a boiled egg = best breakfast ever. I am taking part in various challenges again, including The Great Blogger Bake Off, Bready Steady Go (also by Utterly Scrummy Food for Families) and the Bloggers Bake Along to GBBO. All details below, why not join in? well firstly *claps hands* well done on making your own homemade churned butter !! and your bread – what a gorgeous colour, which must be down to the back treacle. yum! Definitely the treacle adding that beautiful colour – I will definitely use it again. Looking forward to seeing what everyone else has made. 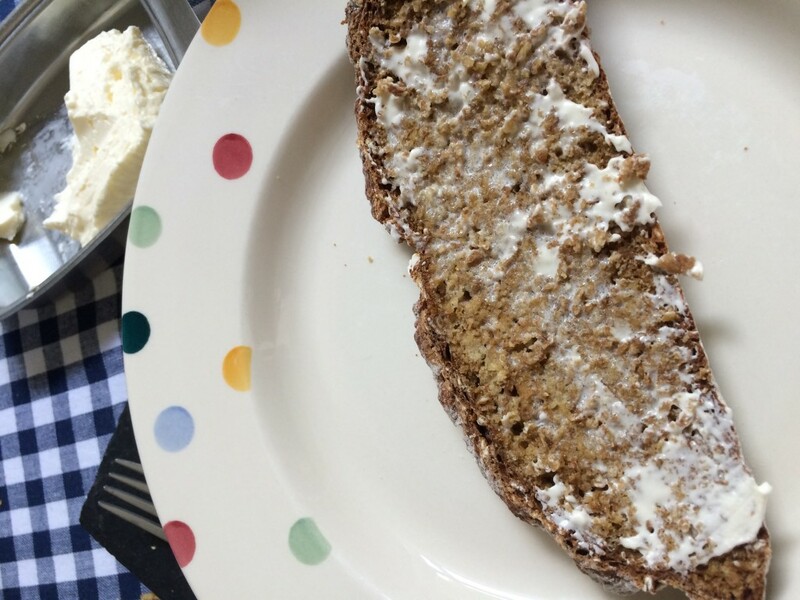 Yes please to warm bread covered in home churned butter. I know, you can’t go too far wrong with warm bread and butter can you?! I had never come across it before – I assumed it would add sweetness but actually it’s just that lovely colour. 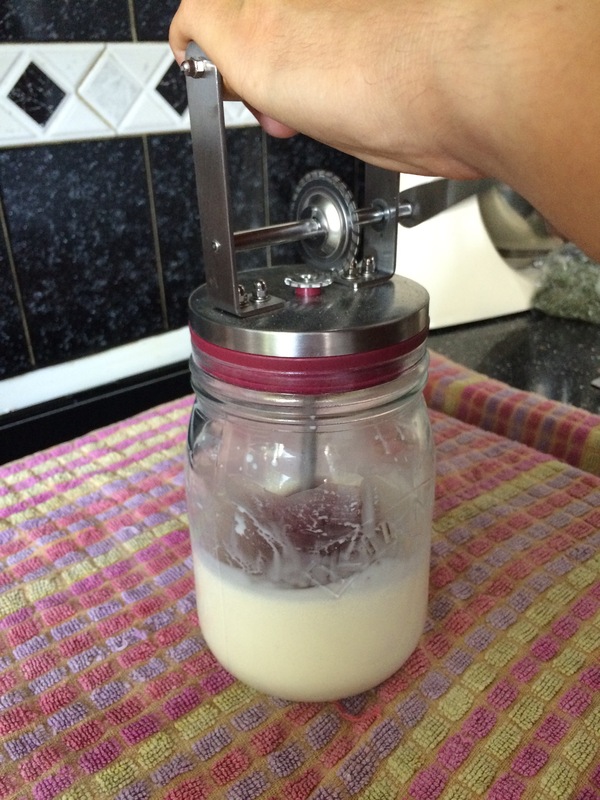 I love making my butter at home, much better than the store bought butter! 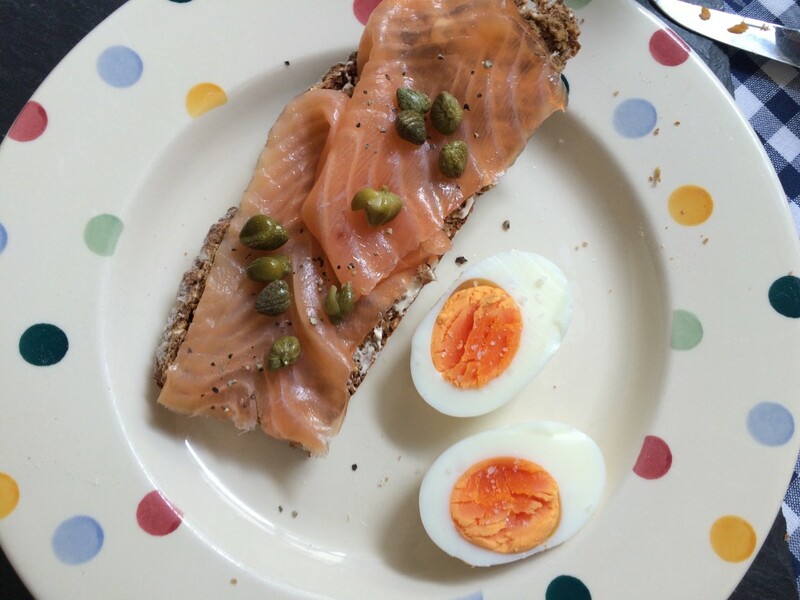 And I add a little bit of salt too yummm and I’m craving a smoked salmon with cream cheese and capers sandwich!! Oh they are great fun – a bit of effort but actually worth it when you realise it works!